Squid has worked goats, sheep and poultry. He works in a controlled manner and is very biddable. He only works when needed and uses dominance behaviors to control the livestock. He is very quiet, almost never barks, sometimes grips when herding. He herds to maintain order, is very protective and attentive to baby livestock but gives the mothers some space. Squid is gentle and protective with children and shows no aggression unless absolutely necessary. Squid is very good at eliminating predators in the territory. Squid barks to announce the arrival of strangers but shows no aggression toward humans unless they pose a threat. 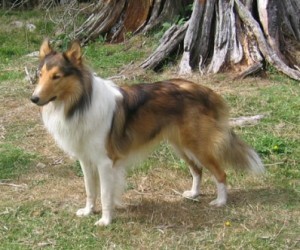 Gavin’s father, Gracehaven’s Angus is an unregistered collie from Canada. Not much is known about his father due to language barriers with his original owners, but his mother’s pedigree indicates she’s from the Cindeross kennels. He’s never shown much interest in herding, but has protected his family and property from large dogs, a wolf mix, and intruders who maced him. Even less is known about Gavin’s mother, Lassie other than I had to have one of her puppies from the moment I met her. She followed her missionary owners up from Peru, where she protected their daughter and kept the neighbor’s sheep from wandering into her yard without being taught to do so. If I were to hazard a guess from how she looked and acted, I would say she was some mixture of rough and border collies, similar in working style to the landrace currently being refined into the Ovelheiro Gaucho breed of Brazil. She was sharp as a tack, highly biddable and fiercely devoted to her little girl. Lassie was lost to an automobile accident last year.